In this Friday, Jan. 18, 2019 image made from video provided by the Survival Media Agency, a teenager wearing a "Make America Great Again" hat, center left, stands in front of an elderly Native American singing and playing a drum in Washington, DC. 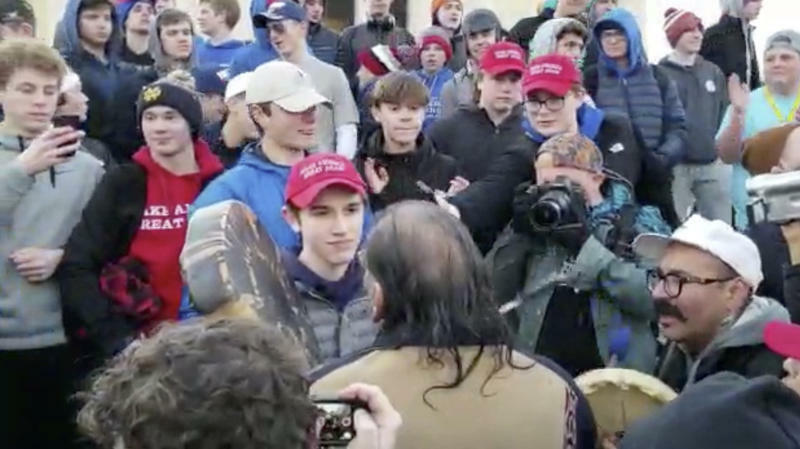 What we each saw in the short video (since deleted) that went viral this weekend of a Covington Catholic High School student staring at a Native American protestor on the National Mall is open to interpretation. Photos and videos carry the authority of truth, yet the 'truth' reflected in a video can vary, depending on what's included, what's left out and how it's framed. The response to the initial video was immediate. Headlines in mainstream publications assumed the MAGA hat-wearing students in DC to attend the March for Life rally were harassing the protestor. Social media went into full outrage mode. 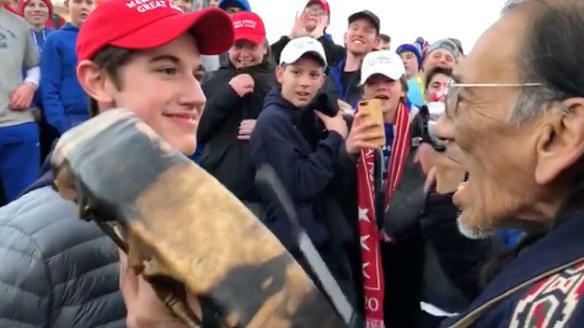 Since the initial video and subsequent rush to judgment, a more detailed video and version of events has come out, along with a letter written by Nick Sandmann, the student in the video. Native American protester and Vietnam veteran Nathan Phillips also responded to the situation. The longer video includes a third group of protesters, the Hebrew Israelites, who can be heard shouting derogatory comments to both the boys and the Native American protesters. We may never fully know what happened on Friday. That's not really the point. Today, it's Colin and your calls. Consider this: Are we too quick to rush to judgment these days or should we trust our first instincts? Is outrage the sole remaining emotion left for us to deal with political conflict? A new study from Yale University concludes that white liberals actually make themselves appear less competent when interacting with African Americans. A crowd of students surrounds the Native American man, laughing and filming on cell phones. One boy, wearing a red Make America Great Again hat, stands just inches away from the man's drum, staring at him with a wide smile. Nathan Phillips, an Omaha elder participating in the Indigenous Peoples March, keeps drumming and singing. A viral video of a Native American man surrounded by teenagers at the Lincoln Memorial in Washington, D.C., created a furor and spurred an apology from the students' Kentucky high school. But since then, other videos and narratives have emerged that give more context to Friday's confrontation. It happened on the same steps where civil rights leader Martin Luther King Jr. called for racial harmony in the U.S. with his famous "I Have a Dream" speech in 1963.